Maine is a unique state with much to offer visitors near and far. From wild moose, to delicious fresh caught lobster right off the boat, to stunning mountain views, Maine is the perfect vacation destination year-round. Maine has a wide range of accommodations for all budgets from camping to rental cottages to fancy hotels. But, wouldn’t it be cool if you could stay in a lighthouse or wilderness yurt? With 65 historical lighthouses dotting the coast of Maine, Maine is often referred to as “The Lighthouse State.” How cool would it be to stay overnight in one? Now’s your chance! Reserve a suite at the luxury Inn at Cuckolds Lighthouse. Each suite is complete with custom woodwork, tranquil ocean colors, and original artwork. You’ll love waking up to panoramic ocean views. Imagine waking up to amazing water views? Look no further than the Riggs Cove Rentals houseboats. Choose from three different houseboats and watch seals play along your boat and fall asleep to the wave lapping against the hull. Do you want a real lighthouse keep experience? Rent the Goose Rocks Lighthouse for a night! This historic lighthouse offers six levels of living space including a deck with Adirondack chairs to enjoy the sunset over the Atlantic. The cost of your stay all goes towards restoring and preserving the beauty of this landmark. Enjoy the tranquil beauty of rural Maine in a furnished canvas platform tent or yurt. Each tent and yurt includes a bed with handmade quilts, table and chairs, and propane fireplace stoves to keep you warm and cozy on cool nights. If yurts and lighthouses aren’t your style, how about a castle by the sea? The Norumbega Inn sitting on a rise overlooking the Penobscot Bay is known simply as “The Castle.” This 11-guest room boutique hotel offers a three-course breakfast with all stays. The Mercury Inn is a small boutique bed and breakfast located in Portland’s historic Parkside neighborhood. Housed in a historic Victorian house, this B&B is all about environmental and economic sustainability. These fully furnished yurts are located on the banks of Runaround Pond and just 15 minutes from the heart of Freeport and L.L. Bean. Opened year-round, you can enjoy activities like fishing, kayaking, and ice skating all from the front door of your yurt. The Seaside Inn in Kennebunk isn’t just any ocean front hotel, it’s the oldest inn in America. Owners, Trish and Ken Mason, are America’s only ninth generation innkeepers! Despite the age of the inn, the hotel is very modern and offers every amenity you would expect in a seaside inn, including free Wi-Fi and hot tubs. The Lindsey Hotel is a beautiful coastal boutique hotel in charming Rockland, Maine. It was built as a sea captain’s house in 1835. Rooms are designed with modern features and a nautical touch. Delicious restaurants are just a stone’s throw from your room. Perfect for family holidays, rent a luxurious or rustic treehouse on this disc golf course near the White Mountain National Park. 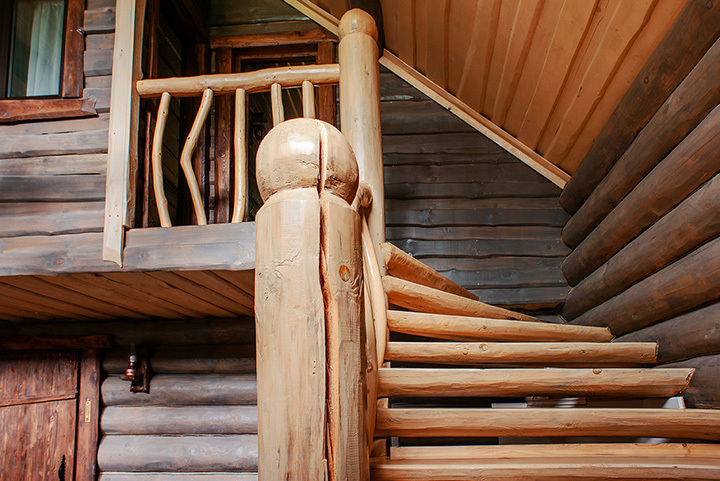 The Grand Oak treehouse is a 1,200 square foot treehouse custom built with lumber harvested and milled on site. It sleeps eight and has a full kitchen and two full baths. If you’re a hunter or maybe just a wildlife photographer, Maine offers hundreds of wilderness lodges and camps to rent. Registered Maine guides, Matagamon Wilderness, can help with your hunt planning and offers several rustic cabin options for your stay. Named as one of the best bed and breakfasts in the United States, the Berry Manor Inn is the premiere luxury inn in the Rockland/Camden area. Rooms are designed with antique Victorian furniture with modern features. The in-house restaurant serves delicious breakfasts daily with locally produced food. For over 140 years, Little Lyford Lodge & Cabins has provided tourists an authentic wilderness experience in the Moosehead Lake region. Run by the Appalachian Mountain Club, Little Lyford has nine private cabins with a woodstove and porch and a co-ed bunkhouse for up to 12 people. Dogs are welcomed in the cabins. Opened in 2015, The Press Hotel is Portland’s newest boutique hotel. Built in the historic Portland Press Herald office and printing plant, hints of the hotel’s past can be seen throughout this 110-room hotel. Guest rooms feature vintage-styled journalist desks, wood floors, and 100 percent local artwork. The Charles Inn is a historical inn nestled in a 1873 commercial building in downtown Bangor. It has an eclectic décor, but comfortable and spacious rooms. It’s just walking distance from restaurants, museums, and the Darling’s Waterfront Pavilion.